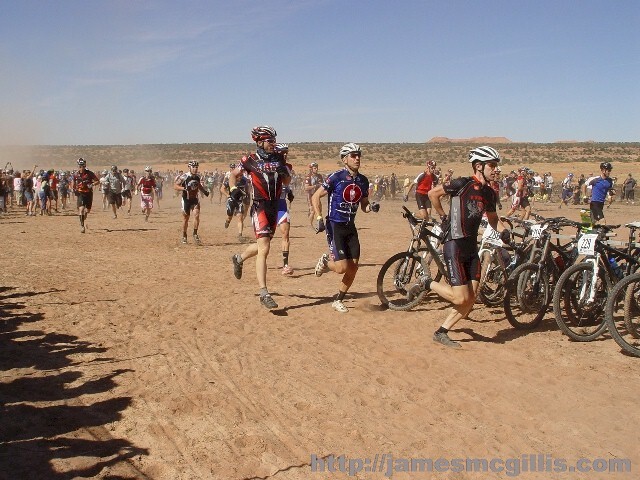 On October 10 and 11, 2009 we were Behind the Rocks near Moab, Utah covering the fifteenth annual 24 Hours of Moab off-road bicycle race. In 2008, we had written about Dax Massey of Boulder, Colorado and his teammate Dean Miller of Littleton, CO. Among the eighteen Duo Pro teams in that contest, Dax and Dean had pedaled the farthest and fastest, thus assuring their class victory. 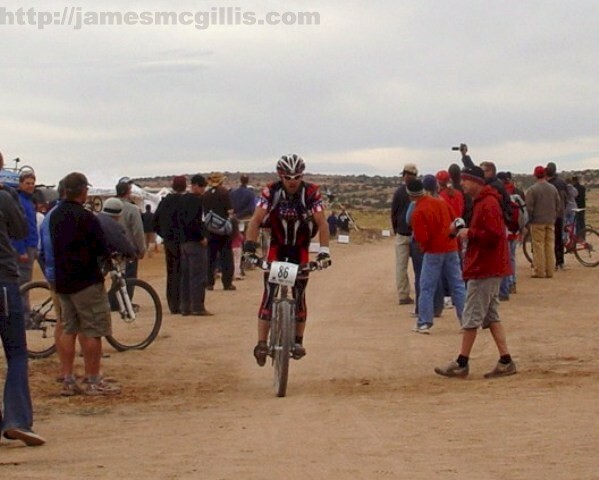 Watch the Video, "24 Hours of Moab 2009"
In order to allow an injured kidney to heal, Dean Miller has sidelined himself for the 2009 season. 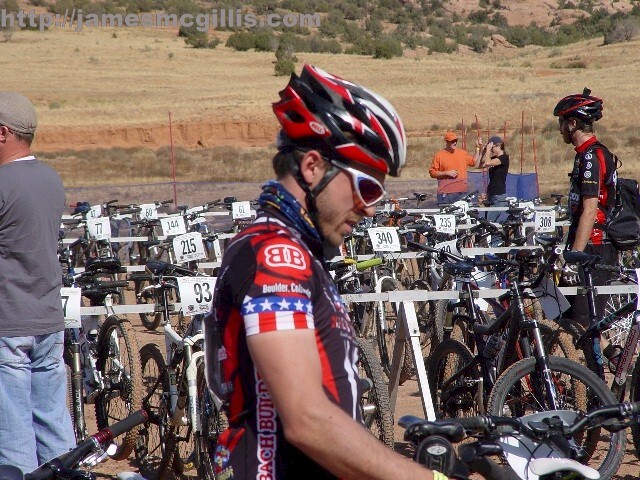 Dean’s temporary retirement required Dax Massey to create a new team or go solo in Moab. 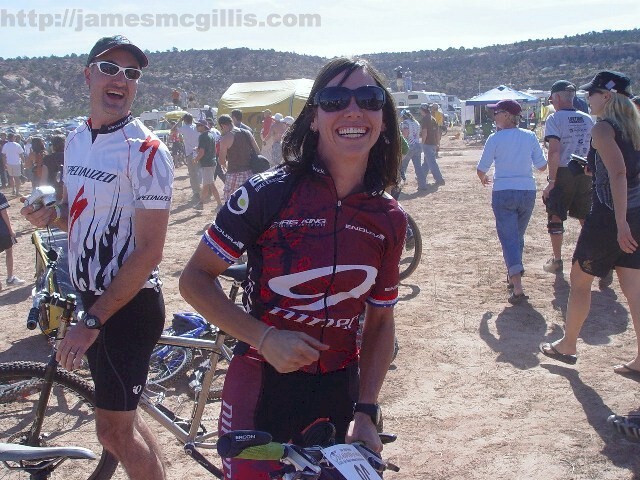 In a lucky break for all, veteran rider Rebecca Tomaszewski joined Dax, forming the #86, Niner - Ergon - Bach Builders team for the 2009 24 Hours of Moab. From experience, we knew to arrive at the racing venue about two hours before the start. This allowed us to speak with Rebecca and Dax before they entered their race-mode. 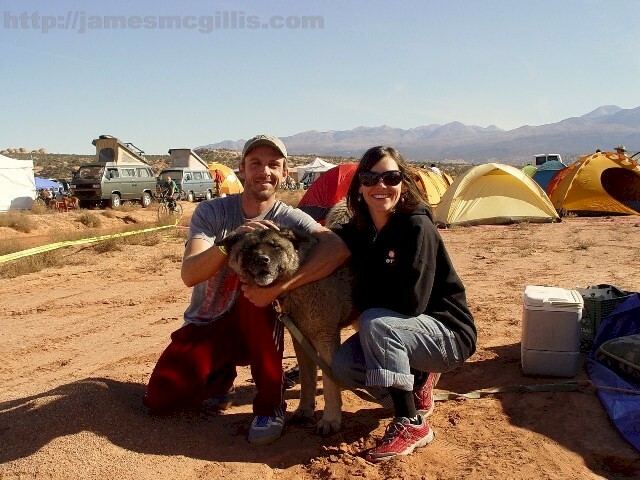 When the two posed for a picture with Kava, the bear-like dog, we could see immediately that the pair made a natural team. They were comfortable with themselves and accepting of the arduous task that lay before them. With Suzuki’s departure this year as a sponsor, the lack of a huge stage structure made the racing venue appear smaller and more intimate. After the “24 Hours of Dust” event last year, we were pleased to see Knut & Sons water truck liberally dispensing its liquid organic dust control agent. Carrie joined me at the race this year, and thoroughly enjoyed both days of the event. We watched the Le Mans start, and then drove back towards U.S. Highway 191. We had invited friends to the Moab Rim RV Campark for dinner that evening. Our comfort while sharing food and wine with friends stood in stark contrast to Rebecca and Dax’s evening pedaling into the darkness on a high desert plateau. 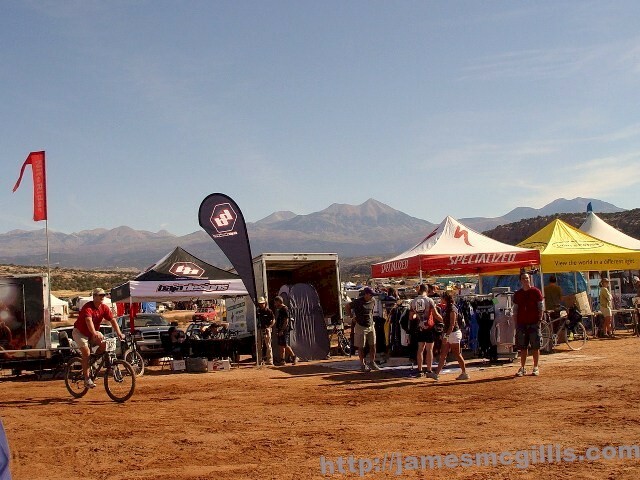 Before we departed the venue on Saturday afternoon, we stopped where the racecourse crossed a sandy dry wash. As second-lap riders started their own first lap of the day, they soon approached a dry wash, cut into the mesa. 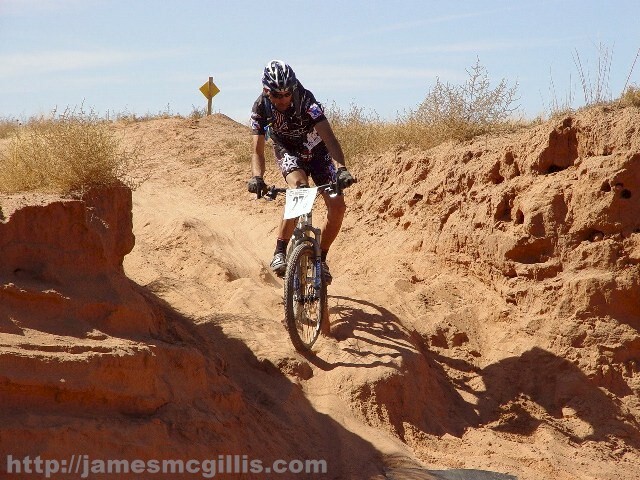 After a brisk ride across the mesa, riders faced a steep cut, dropping about fifteen feet to the bottom of the wash. As ever more riders arrived at this point, they poured over the precipice. This continual flow of humans and bicycles reminded us of an old movie, showing hundreds of lemmings dropping off cliffs and into the sea. As the intensity of race activity increased, bicycle brakes were useless on the slope. 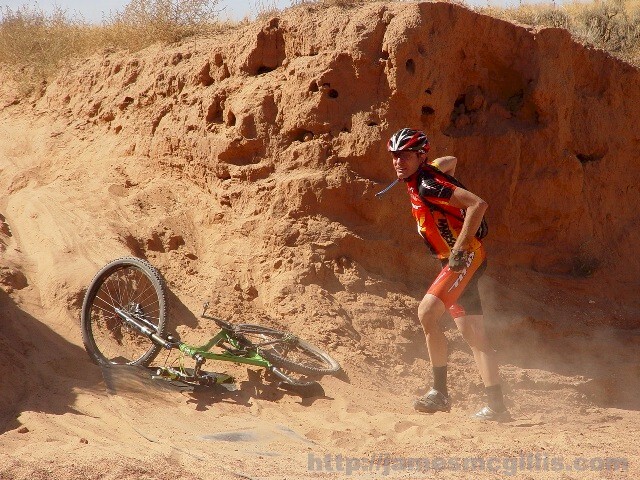 One either rolled out on to the mat at the bottom of the hill, or went head first over the handlebars. Already, at this early stage of the race, the non-woven mat intended as a viaduct across the sand was out of place. Riders either bulled their way across the sand with main strength or dismounted and ran across the arroyo beside their bikes. Later, we heard that the accident rate at this year’s race exceeded that of all fourteen previous 24 Hours of Moab races. Although most accidents happened in darkness, paramedics and emergency medical technicians were often busy stabilizing injured riders and transporting them to Allen Memorial Hospital in Moab. With all of our technology and expertise, why should accidents and injuries at the race reach an all-time high? We believe that the continued deterioration of the course is the main problem. In order not to destroy any more of the desert than the existing racecourse already has, only minor course changes occur from year to year. With evermore loose soil and erosion throughout the course, tire traction fails and spills become commonplace. If organizers change the course to a new track, that will create yet another scar on the land. Yet, the longer the race runs on the old course, the more dangerous it will become. Is there a logical and cost-effective solution to both the environmental and safety issues that now exist? Yes, but it will take a paradigm shift for race organizers and environmentalists alike. Granny Gear Productions is proud that after each race, they leave the venue in as close to a natural state as they found it before setup. Previously used for cattle grazing, the area is far from pristine. Still, the lack of barriers along the entry road invites campers to create new entrances into the campground at will. On the racecourse, temporary ramps and rubberized viaducts shift easily, but staking down the mats would create an additional hazard for riders. 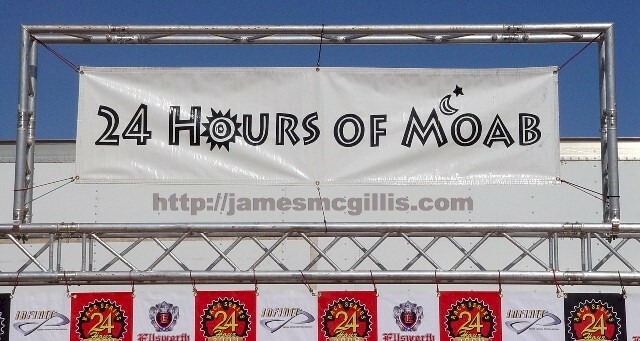 After fifteen consecutive years, the 24 Hours of Moab is a tradition that appears to have staying power. Environmentalists can lament the long, slow process of deterioration at Behind the Rocks, or they can get involved and help create solutions. In and around Moab, there is more trail rehabilitation expertise than almost anywhere in the country. With as many jeep trails, bicycle tracks and social roads that exist in the area, trail restoration has become the non-profit cottage industry of choice. Organizations such as Red Rock Forests, Plateau Restoration, National Public Lands Day and others have local experience in such matters. If they were to collaborate with Granny Gear Productions and the Bureau of Land Management, a working restoration and maintenance plan for the entire venue could easily arise. To leave the plateau in its current state of mismanagement, invites further destruction of the local environment. 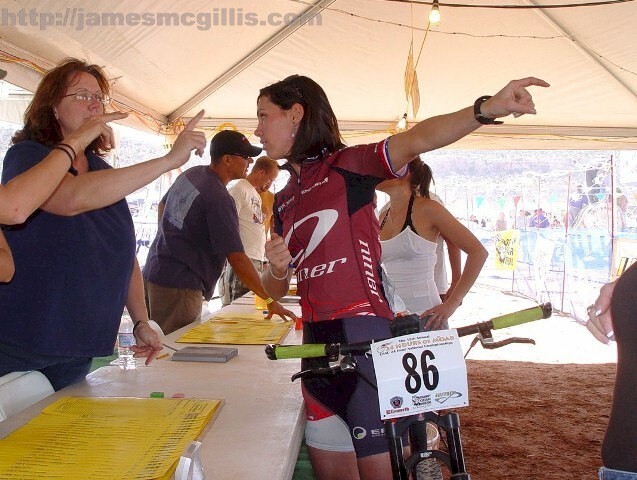 If the environmental and bicycle racing communities do nothing, the plateau will become a vortex for dust storms even larger than the one that hit on race day 2008. Directly downwind of Behind the Rocks are the La Sal Mountains. Already in 2009, the La Sal snowpack received two major dust storms from as far south as Monument Valley, Arizona. The more dust that falls on the snowpack, the quicker the snowmelt and the less water there will be available to irrigate the Spanish Valley and Moab. As we returned to the venue on Sunday morning, the air was clear and bright. Rebecca had finished her eighth and final 14.9-mile lap of the race. She admitted to us that at around 4:00 AM, her resolve and composure had vanished in the night. Somehow, she had retained enough energy to finish that lap without incident. As the new day dawned, she went on to complete two more circuits of the course. As we arrived, Dax was out on the course, completing his final lap of the race. With only two minutes remaining before the gun sounded, Dax completed his team’s final lap. Throughout the previous twenty-four hours, his lap times had never varied by more than fourteen minutes. As Dax rode into the scoring tent, the intensity of the moment was apparent on his face. Until he logged in with the scorers for the final time, there was no letdown in his intensity. As we had hoped, Rebecca Tomaszewski and Dax Massey not only won their class, they placed thirtieth overall in a starting field of 365 teams. Of the twenty-five teams that completed seventeen laps, Rebecca and Dax were the fastest. Although the course was challenging and they had stretched their physical and emotional endurance to the limits, Rebecca and Dax graciously accepted their award. 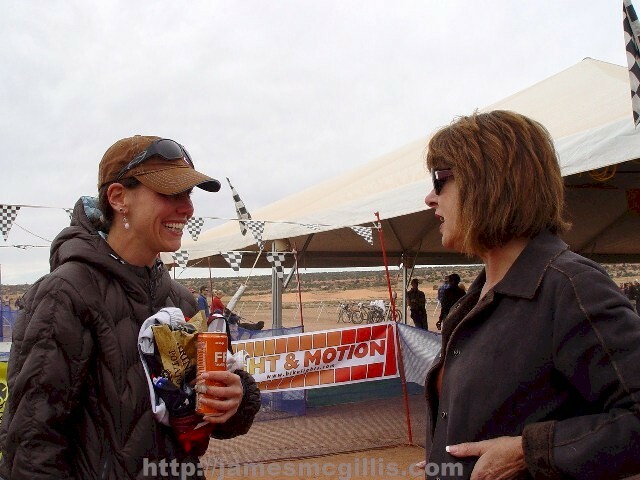 When it was over, their convincing victory at the 2009 24 Hours of Moab thrilled their many fans, including Carrie and me.